Karppinen, H. et al. Age Ageing. Published online: April 13 2016. Background: little is known about the oldest-olds’ views on ageing. Objective: to investigate older people’s desire and the reasons they give for wanting to live to 100. Design: a postal questionnaire, analysed both quantitatively and qualitatively. Setting: population based in Helsinki, Finland. Subjects: a random sample (response rate 64%; N = 1,405) of community-dwelling older people (aged 75–96). Methods: a structured self-completed questionnaire with an open-ended question on the reasons why/why not participants wished/did not wish to live to 100. Results: one-third (32.9%) of home-dwelling older people wanted to live to be 100. Those who did were older, more often male and self-rated their health better than those who did not. Often the desire for long life was conditional: ‘Yes, if I stay healthy’. Among the reasons is that many were curious to see what would happen. Many stated that they loved life, they had twinkle in their eye or significant life roles. Those who did not want to live extremely long lives gave various rationales: they would become disabled, life would be meaningless, they were reluctant to become a burden to others or they feared loss of autonomy or suffering pain or loneliness. Some people also shared the view that they should not intervene in destiny or they felt that they had accomplished what they wanted in life. Conclusions: one-third of the oldest-old participants wanted to live to 100. Identifying what motivated them to desire long life could be a resource in their care plans. Providing high quality end of life care that is truly centred around the needs of the individual and their loved ones is an important outcome to aim for. Given the complexity of ensuring all the patient’s needs are met, wherever possible, requires all the agencies to work together. The ‘Ambitions for Palliative and End of Life Care: A national framework for local action 2015-2020’, stresses how we must all work together to find new ways of delivering better care to make a difference. The role of commissioners in collaborative working continues to be fundamental in making progress in end of life care. The toolkit is aimed at being a useful resource which is complimentary to the overall national strategic direction, whilst aiming to support commissioners ‘commission high quality end of life care’ and to be complimentary to their local Sustainable Transformation Plans. Elwyn, G. BMJ Clinical Evidence Blog. Published online: 14 April 2016. It is often said that humans are terrible at understanding risk. Maybe so when it comes to ratios and rates – abstract forms of data. But all of us navigate the world by moving, walking or driving – constantly comparing distances, magnitudes and likelihoods, making estimates about the risk of collisions, repeatedly, and accurately. We are actually risk calculators extraordinaire – and we do it all effortlessly, using heuristics, and get it right, most of the time. Our survival depends on it. But when it comes to health care – we are less confident. When to start a medication? When to have an operation or a test? Plus, we have much less experience to draw on. And less data. Often, no data at all. When it comes to risk communication, pictures, though not perfect, help show what happens at population levels. An icon array (see Figure 1) elegantly combines the idea of reference class (100 men between 50 and 60). They have conditionitis and are asked to consider the benefits of treatment A (blue stick men) or treatment B (green stick men). 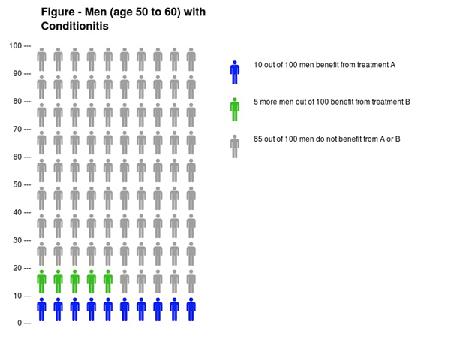 Treatment A is twice as effective as treatment B (relative risk), but the absolute benefit is more modest number, i.e. 5 more men in a hundred (10 minus 5). But note that even then 85 men who do not benefit at all. And by the way, stick figures (bathroom symbols) are better it seems than smiley faces or ovals. It is the kind of graphic that should guide all conversations about decisions in healthcare. In the land of the blind, we could at least become partially sighted. The guideline says that GPs should discuss storage options for prescribed controlled drugs, such as a lockable or non-lockable storage box. It says that this discussion should consider whether the controlled drugs will be accessible to people who should not have access to them and whether the storage method could increase the risk of patient safety incidents. Fourteen people attending an adult day programme were recruited to a structured horticultural therapy programme which took place over 10 weeks. The effects were assessed using Dementia Care Mapping and questionnaires completed by family carers. High levels of wellbeing were observed while the participants were engaged in horticultural therapy, and these were sustained once the programme was completed. This study adds to the growing evidence on the benefits of horticultural therapy for people with dementia who have enjoyed gardening in the past. NHS Clinical Commissioners Finance Forum has published an infographic Mythbusting CCG finances: the truth behind allocation growth. 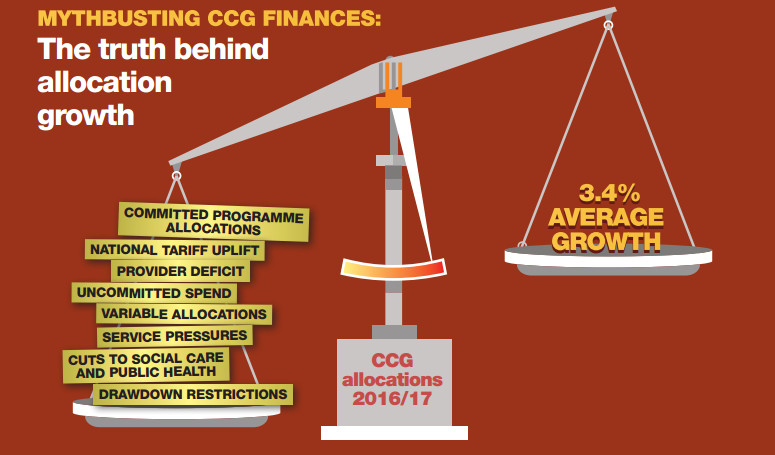 This graphic highlights the number of pressures that affect CCG allocation growth and shows why many CCGs may struggle to balance their budgets. NHS England has published a Framework for patient and public participation in primary care commissioning. This framework is a guide for primary care commissioners and anyone who is interested, including patients and the public, the voluntary sector, and providers of health and social care services on how to involve patients and the public in the commissioning of primary care services.